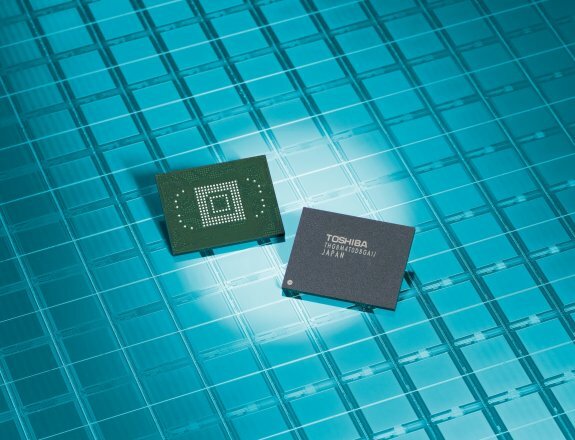 Toshiba introduced its 24nm eMMC devices with toggle-mode DDR NAND for enhanced performance. Toshiba America Electronic Components, Inc. (TAEC)* today announced that it has enhanced its NAND flash portfolio with the introduction of a family of higher performance 24-nanometer (nm) e-MMC™ devices. Greatly reducing the bottlenecks often encountered by single data rate NAND, the use of toggle-mode double data rate (DDR) NAND improves performance and enables faster random access and sequential performance. With densities ranging from 2-gigabyte1 (GB) to 128GB, these new embedded NAND flash memory modules feature the world's smallest geometry e-MMC, one of the highest capacities achieved in the industry, and offer full compliance with the JEDEC e-MMC Version 4.41 standard. Toshiba's 24nm e-MMC process lowers costs, enables higher densities, boosts performance and allows for smaller packages – all of which are key requirements for space-conscious applications such as smartphones, tablet PC s, eBooks, digital video cameras, printers, servers, and POS systems. Integrating up to 128GB NAND and an e-MMC controller in a single package, Toshiba's new family of 24nm e-MMC devices combine up to 16 pieces of 64Gbit (equal to 8GB) NAND chips fabricated with Toshiba's cutting-edge 24nm process technology. Toshiba was the first company to succeed in combining 16 pieces of 64Gbit die in e-MMC to achieve 128GB of memory by applying advanced chip thinning and layering technologies to realize individual chips that are only 30 micrometers thick. Full compliance with the JEDEC e-MMC Version 4.41 (V4.41) standard for embedded MultiMediaCards supports standard interfacing and simplifies product design-in, reducing development burdens on product manufacturers. A wide product line-up supports capacities from 2 GB to 128GB. Samples of 8GB, 16GB, 32GB and 64GB 24nm e-MMC product family are available now, and mass production will begin in Q3, with other densities to follow.